Blazer c/o Kelly Wearstler (on sale here), Vintage chiffon overlay shirt, Sugarlips Temple Etching pants, Maison Martin Margiela purse, Sunglasses c/o Lookmatic, Pour La Victoire Allena booties (last worn here). 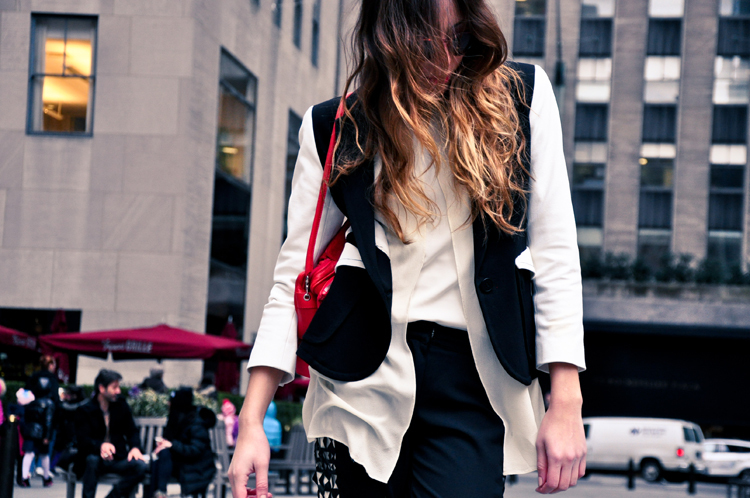 Another recent obsession would have to be this black and white blazer by Kelly Wearstler. The tailoring is impeccable, and the contrasting sleeves and pockets add a sporty touch to any outfit while still looking effortlessly chic. Also - anyone recognize the background? We're in Rockefeller Center! Micol took a little coffee break from work during one of my rare daytime appearances in the city, so we thought it would be fun to do a quick shoot. I still prefer Brooklyn backdrops, but it makes for a nice change of pace, n'est pas? love this look! that bag is sooooo fabulous!!!!! Lovely photos for a very lovely outfit! 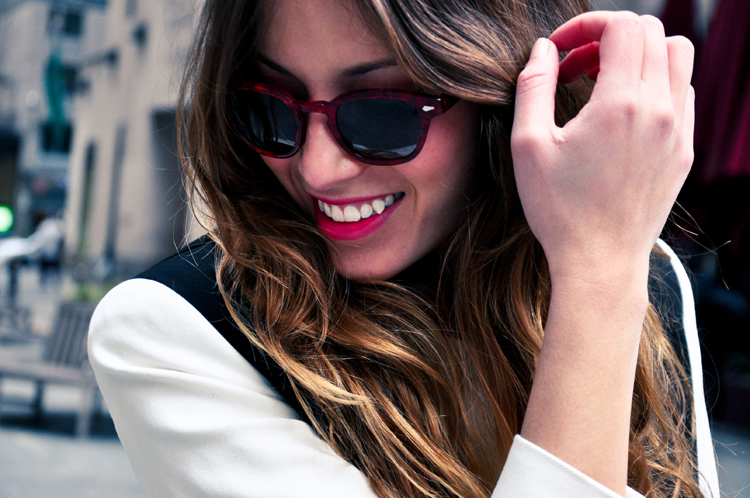 Red accents are perfect for such a classic look. This outfit is awesome. Love the bag. This is such a great outfit & the print down the side of those pants is amazing! Such a nice little detail. Love the red accents too, especially that Margiela purse, it's beautiful! perfect black and white outfit! I'm loving those sunglasses. Work it! Love the pockets on the blazer. This is one of the best blogger outfits I've seen in a while. The long shirt under the blazer add just the right amount of intrigue and those print stripe pants are such a nice touch. Love how you paired with the red. Great styling ladies. Love the black and white, so incredibly chic! Everything looks so fluid. You really know how to wear clothes, yours never look stiff, uncomfortable, that is elegance. black white & red so chic ! I am loving this black and white trend. It always looks so amazing. The red accents are perfect! This is such a great outfit! Beautiful outfit! Love that lip colour, love the bag, love the entire look! pretty outfit! :) want to follow eachother? let me know :) thanks so much! Swooned over a Kelly Wearstler leather jacket on my blog today :) Your blazer is gorgeous. Love those legggings too! Music Fest Must-Haves + $300 Beso Giveaway!